Can you make bread in a tin can? Yes! 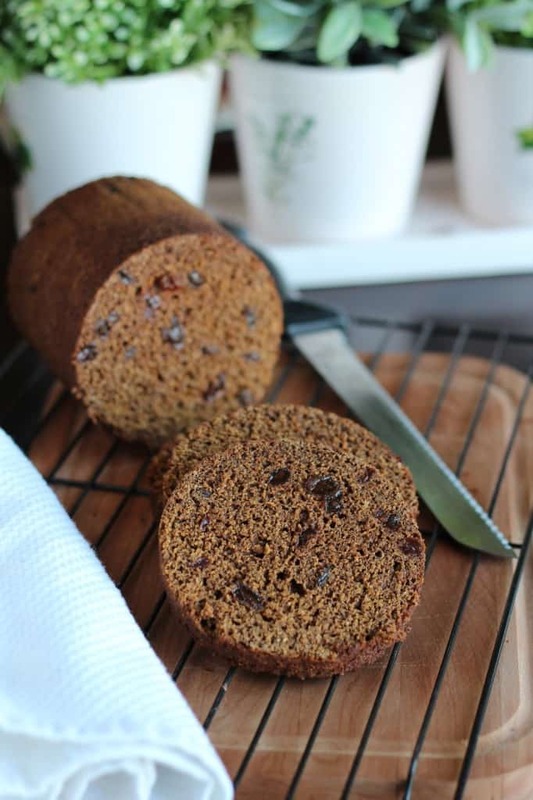 Try this recipe for Boston Brown Bread from the Epicurious site. It’s a unique rye bread recipe steamed in a tin can such as a coffee container. January has rolled around and the #BreadBakers are busy again in our kitchens, won’t you join us? We are starting on a healthy note, following Anshie’s lead and baking with RYE. Rye flour was previously not in my pantry but I learned that I should bake with it more often. Rye is high in fiber, a good source of magnesium as well as a host of other nutrients. 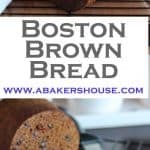 What ingredients are in traditional Boston Brown Bread? For a rye bread to share today, I settled on this recipe for Boston Brown Bread from the Epicurious site. It’s a unique bread steamed in a tin can such as a coffee container. Now I’ve seen episodes of cooking shows where the contestants are given a mystery ingredient of “bread in a can” and then challenged to create a tasty dish. I was concerned that baking bread in a can on purpose might not have a great result but I was happily proved wrong. There were many recipes online and nearly all had the same ratio of one part each of rye flour, whole wheat flour and cornmeal. A quick search for a history lesson taught me that rye and cornmeal were more widely available at one point and so bakers came up with this mixture of flours for their breads. Tins were a readily accessible vessel and steaming the dough was a method that home bakers could master. One challenge for me was finding a coffee tin (or any other tin!) that was made from metal– so many of our goods are stored in sturdy cardboard containers. A bit of luck and a tin can appeared when my relatives who were visiting from England brought some treats and one was a tall tin of crackers. Unfortunately, I wrongly assumed this was a metal tin and didn’t realize my error until I had my ingredients mixed and ready to go. I proceeded anyway and had no major failures but I would suggest to wrap the bottom half of such a cardboard container in tin foil first to provide a barrier between the water and the cardboard. It was fun to have this round, cylindrical bread for a change. You’ll notice in the comments below that a reader mentioned that she uses a large, wide-mouthed mason jar as a baking vessel. Using a canning jar (and not any old glass jar) sounds like a good idea. Canning jars are already made to withstand high heat and should be fine in the oven’s heat. Is this traditional Boston Brown Bread recipe familiar? I’ve love to learn if this is mainly a New England specialty or if its popularity has spread. Try this baking experiment and bake directly in a can to make this round loaf of Boston Brown Bread. Preheat oven to 325 degrees F. You'll need a tin can like a 1-pound coffee can or other similar vessel. Also you will need a deep pan suitable for baking into which you'll put the tin can while it bakes. Spray the tin can with baking spray. If your can is not made of metal cover the bottom half of it with aluminum foil. Gently whisk the rye flour, whole wheat flour, and cornmeal, as well as the baking soda and salt. Mix in the molasses and milk then add the raisins. Pour the batter into the mold. Cover the top with aluminum foil and secure with twine. Put your filled can into a deep baking dish in the oven, then take boiling water and pour it into the dish a few inches deep. *Note-- it is easier to fill the dish with water while the dish is in the oven RATHER than filling the dish on a counter top and walking with the boiling water filled dish to the oven. Bake for two hours. The recipe suggests letting the bread sit for an hour then unmolding but I chose to unmold after about ten minutes. If the bread has pulled slightly away from the sides of your container you should be fine to empty it out to cool. I did this since my container was made of cardboard rather than metal and I didn't want the wet cardboard touching the bread as it cooled. I love the look of the round loaf. I have got to try baking bread in a tin soon. Thanks, Renee, I thought your rye crackers were gorgeous. Loved the photo ahead of time on Facebook and really enjoyed your post this week. Boston Brown Bread has been on the list-in-my-head for a long time. Thanks for giving me the push I need to give it a try! I am not sure why I hadn’t heard of this bread before but it was easy to make and now that I have the ingredients, I am sure I’ll make it again. Seems like the only thing that still comes in a big can is either coffee or maybe family size pasta sauce. I’m glad you managed to find something suitable, Holly, because the bread looks lovely. I especially like the addition of raisins. Thanks, Stacy, I think raisins or currants would be a nice addition and wondered if nuts or dates every were a traditional ingredient too. I liked that this type of bread had a history that was new to me. Beautiful bread Holly! Looks like you came up with a good solution for your metal can problem. You never think about these things going by the wayside until you start looking. Very clever and I, too, wouldn’t have thought about how hard it is to find a tin can. Isn’t it funny that sometimes the most basic steps of a recipe can be tricky while the actual making and baking part is a cinch? Happy to bake along with you this month, Wendy! Holly! That is an IMPRESSIVE bread. err. do you have leftovers? I so wish we lived closer so I could taste all your magical bakes! Thanks, Ansh, for leading us this month and for the time and effort involved. I hope 2015 is off to a good start for you! Fascinating, thanks for the history lesson and new technique! I wonder if there is a list of other breads that steam like this– I’ll have to look into it for future #BreadBakers challenges. great baking with you this month! I am going to try your crock pot method next time, Mireille, now that I have the ingredients it will be easy. Great looking bread, Holly, and I love the history lesson too! I’ve always been fascinated by bread in a can but I’ve never ventured there myself. Your bread is definitely calling my name. I even have stuff in tin cans that I can use! Sounds good, Robin, finding the right tin is the hard part. Making this bread was no trouble at all. Yes! If you have coffee cans, set one aside to bake this bread. Hope you find time to bake this brown bread. Thanks, Karen, your bread was amazing again this month! I must try this bread baked in a can. I love the look! Finding the right can is the hardest part– the bread is mixed up quickly and there is very little hands-on time for this recipe. I loved the form of bread, which most great idea of baking in a tin !! 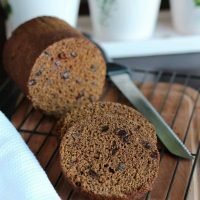 I’d never heard of Boston brown bread before until this month’s challenge, I love the sound of it as I like raisins in my bread. Great unique method of baking it in a tin, it looks fabulous. Instead of tin cans use 1 pint wide mouth canning jars used for canning jams and jellies. They are the same size and shape of a 16 oz tin can. They are non reactive and because they are used in canning are able to withstand the cooking technique used for this recipe. They can be purchased in most hardware stores or on Amazon by the 1 dozen case for about $12. Thanks for this tip! I have not baked with mason jars before but think it is a good idea. I assume the WIDE mouth jars are the key because the bread can still slide out after it is baked? Thanks for pointing that out.